As drought-fueled wildfires rage across the West, farm communities on the frontlines are feeling the heat. As you read this, wildfires are burning on about 1.7 million acres of land across the western United States. Most are in Washington and Oregon, where fire is raging uncontained in 23 separate locations. So far this year, nearly 7.7 million acres have been directly affected by wildfires—almost three times more than by this point last year. Harvest season is also in full swing in Oregon and Washington, the states that produce most of the country’s apples, pears, cherries, and hops (for brewing beer). 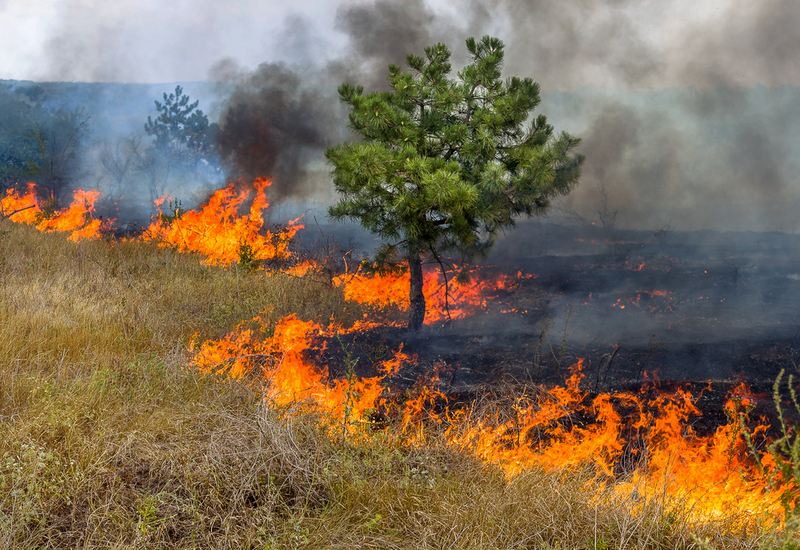 While it’s still too early to gauge the full impact of this year’s wildfire season on the nation’s agriculture, it is clear that the effects are already being felt. “I’ve been in the business almost 35 years and can’t remember when wildfire attacked a building of any significance from the outside,” said Mac Riggan, director of marketing for Chelan Fresh Marking, a north central Washington fruit co-op that lost a 240,000 square foot packing plant when a wildfire encroached on the building in mid-August. Despite losing about 450,000 boxes packed with about 1.8 million pounds of apples and damages estimated at between $50 and $80 million, Riggan struck an optimistic note. The fire only damaged a small part of their enormous operations, he explained to Civil Eats. “We’re back to normal and we’re packing fruit at our warehouses,” he added. In late June, wind blew a wildfire into Wenatchee, Washington, destroying homes and seriously damaging several fruit packing facilities and related business property. “We’re one of the several [growers] that had a plant burn down, but we have numerous ones so we’re okay,” said Pepperl. He explained that embers from the same fire that hit Stemilt’s packing plant also ignited the fire that destroyed facilities belonging to the Bluebird Inc. fruit co-op, and at the Michelsen Packaging Co. and Northwest Wholesale, Inc., which both sell produce packing equipment. “I live in a neighborhood that burned down,” said Pepperl recounting how Wenatchee lost 30 homes in one three-day period. “It’s a mess here now,” he said. Pepperl also explained that orchards themselves are fire-resistant. “The perimeters sometimes burn,” said Pepperl, but the fruit trees can act as a fire buffer. Local orchards haven’t suffered fire damage, but further north in Okanagan County—the epicenter of the current Washington fires—some orchards have. Overall, this year’s crops are okay. That said, the bigger farms with more resources can weather these impacts far better than can smaller growers like those in Washington’s Methow Valley, where fires have damaged buildings, forced evacuations, and caused extreme smoke conditions. While less dramatic than fire damage, smoke and heat make air quality unhealthy and this curtails field work hours, disrupts the harvest, and causes financial hardships for farmworkers. “Right now we’re definitely trying to keep an eye on harm to livestock,” said Washington State Department of Agriculture (WSDA) communications director Hector Castro. In Douglas County, in north central Washington, “about a dozen head of cattle were caught in a fires and killed,” said Castro. “Most owners are opening fences to let livestock get out of the way,” he explained. “So we’ll probably be spending months rounding up cattle when we get to the recovery phase.” Beef cattle are one of Washington’s top 10 agricultural products, according to Castro, worth some $700 million in 2014. While only a small area has yet been officially assessed, many ranchers are reporting loss and damages in the enormous fires further north in Okanagan County, where some public land leased for grazing is on fire. One rancher told the Capital Press he was treating some cattle for burned feet and loading others to be sold because he had no safe place for them. “Rangelands are burned out, some ranchers have lost haystacks, and some have lost cattle to the fire,” said Vic Stokes, past president of the Washington Cattlemen’s Association. “A lot of cattle are surviving, but people still haven’t been about to get into some areas because the fires are still active,” said Stokes, who lost 90 percent of his ranch in last year’s Carlton fire. Similar reports are coming from eastern Oregon ranchers, said Oregon Department of Agriculture spokesperson Bruce Pokarney. Castro also reports that fire destroyed thousands of chickens in a poultry operation in western Washington. “One grower [in Okanagan County] reports that he may not be able to harvest his apples because of heat and smoke,” said Louisa Moro, director of Washington’s Opportunities Industrialization Center based in Wenatchee, which works with the Association of Farmworker Opportunity Programs. These conditions mean, “workers are not able to stay out in the fields very long,” she explained. Some employers are giving out masks, said Moro. This is especially rough timing because many farmworkers are losing hours (and income) to the summer’s extreme heat, that, along with the record-breaking drought, has been fueling the fires, said PCUN (Pineros y Campesinos Unidos del Noroeste) president Ramon Ramirez. In this year’s heat, cherry picking had to stop by 10 or 11 a.m., instead of 1 or 2 in the afternoon, said Pepperl. Some growers are having more people harvest fruit all at once, rather than paying more people for longer hours, said Michael. “You have to take advantage of early morning cool temperatures and better air or wait until the wind clears the smoke out and makes it safe to work,” he explained. According to Ramirez, a number of farmworkers have been hired to fight fires, by the U.S. Forest Service, Bureau of Land Management, and Oregon and Washington state agencies. “This is not a new practice, but the extent of the firefighting this year is. It’s huge,” he explained. “This could effect some of the harvest coming up, like the grape harvest [if people are still off fighting fires],” said Ramirez. “It’s going to be a long recovery,” said rancher Vic Stokes, sharing a sentiment to which most agriculture communities in these areas can likely relate. On Saturday, a storm with strong winds and rain blew into western Oregon and Washington. Wind and some rain are also forecast for the eastern parts of those states where it’s hoped the moisture will help quell the fires.